When I saw that David C. Cook was re-releasing Arleta Richardson’s Grandma’s Attic series of books — including In Grandma’s Attic and More Stories from Grandma’s Attic — well, first I was thrilled. And then I realized, I needed to highlight these books, some of my favorites from my childhood. 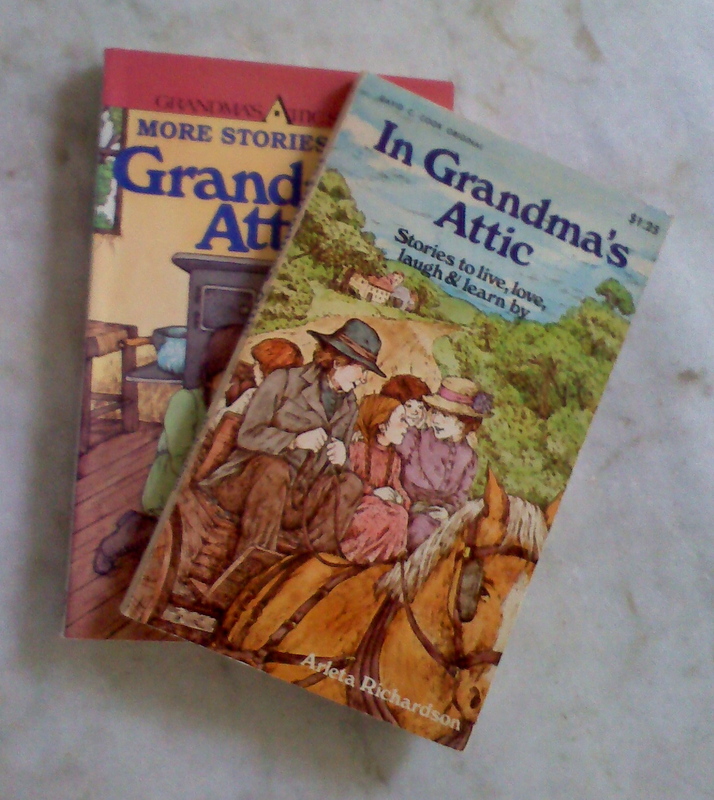 The first, In Grandma’s Attic, was originally published in 1974. My copy’s title page is inscribed with my late grandmother’s name. There are other titles in the series, but as I recall, these early ones are the best. I have a fondness for the covers on my early editions (1976, 1979) over the new ones, but I’ll admit the new ones are an improvement over some from the intervening years. These are both listed has having an April 1, 2011 release date, but they’ve been available for at least a few days already. The stories are sweet, but not sappy. And enduring, as the date of original publication and current re-issuing attest. While these stories don’t mirror my time with Grandma, I think they do inform it, somehow. Did you read these books, were you aware of them? What is one of your favorite books from your childhood? Arleta Richardson (1923-2004), in addition to being an author (this is her most well-known series), was also a teacher and librarian. This entry was posted in books, Christian Fiction, fiction, historical, Middle Grade, WordLily and tagged book spotlight, reading. Bookmark the permalink. there were a set of books called Uncle Arthur’s Bedtime stories. They were..horrible, frightening..terrible. Yet I went back and read and reread maybe just to see if they were so awful. And yup they were. Say I just got a blog idea from you..Thanks and good post! I loved those books when I was a child! I recently found them at a used book store and snatched them up, but I’m thrilled to see they are being rereleased! I haven’t read these, but they sound delightful. They’re going on the list. I remember them so very fondly. Hope you enjoy them!